Goal setting software supercharges your life. With the right software you harness their built-in goal setting strategies to set and achieve success. After putting the spot light on Achieve Planner, I couldn't wait to get to my computer to write this review of goal setting software. The reason why I like this software is that it instils similar goal setting strategies that I use with elite athletes, business professionals, and students in my professional practice. Taking advantage of their free 30 day trial, I found that the software helped in a number of ways. Firstly it asked me to identify the categories or life areas in which I wanted to set goals. This is similar to the brainstorming of goals and values that are provided in my goal setting worksheet. I plugged these goals into the master outline which allowed me to get a birds eye view of all my projects and activities. It looked a little like the screenshot to your right. If you try the software you will still need to do the hard work identifying the areas of your life that are important to you and the goals you want to set. 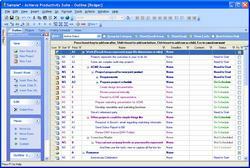 However, the software did a great job of helping me to clarify what I needed to do to achieve these goals. ✔ capturing all the tasks that I needed to do to achieve your goal. 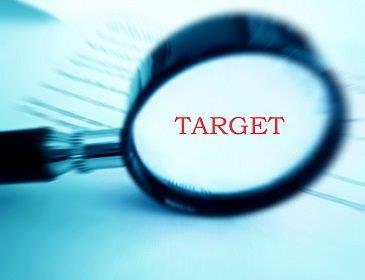 This allowed me to develop my goal setting plan with target dates. ✔ helped me to organize and prioritize my actions to ensure goal completion. ✔ track my goal progress with the press of a button. ✔ help me to define my goals in the key areas of your life. By taking this balanced approach, the goal setting software allowed me to set goals in the areas that were vital to my definition of success. Because I had all my projects and actionable sub-items in the one spot I was now able organize and prioritize my tasks using a hierarchical structure and also importantly focus on sub-tasks of each project. I loved the powerful task chooser. Because I often have 200 hours of work that needs to be prioritized into 50 hours a week, the powerful task chooser actually helped me to select the best tasks to work on across all my projects. It did this by looking at deadlines and task importance. 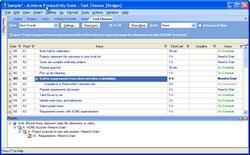 Here is a screenshot of the powerful task chooser. BUT it is important to remember that goal setting is a skill. What this means is that software for goal setting won’t improve your goal setting if you haven’t mastered the necessary goal setting skills. Using goal software without the goal setting skills is like buying a grand piano and expecting to be able to play like a concert pianist....unrealistic if you haven’t done the practice! Because goal setting is a skill, like any skill, whether playing tennis or learning to drive, you need to practice to improve. If you buy software for goal setting and simply ‘set and forget’ your goals or don’t put into place any of these goal setting tips...then you can expect to find yourself setting the same goals as last year. Discipline and drive are the furnaces that harness the focus and power of your goal setting experience. But to me this is where this goal setting software exceeds my expectations. When I set my goals the software asked me to identify the actions I needed to take to achieve my goals. Importantly, I was able to set them up as scheduled tasks and appointment items. It did this by allowing me to schedule all of my time critical tasks, meetings, and block out time to get things done. To me this weekly planning tool really enabled me to ensure that I schedule those things that enable me to reach my goal, in other words I am making time for those things that are important rather than trying to find time. 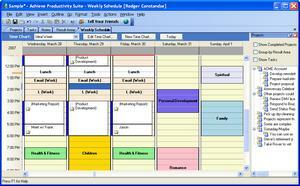 Here is a screenshot of the weekly planning wizard. I also liked the reminders that prompted me (on a daily basis) to focus on what matters most...and in doing so, instilling daily habits of success. The goal setting software also provided me with inspirational goal setting quotes and motivational posters which could be incorporated into difficult goals. I found this really useful when my motivation and confidence to keep going was flagging! While I found the upfront work in setting my goal routines and required tasks cumbersome and a little time-consuming, all the hard work at the start meant payed off over time. Because I had a written goal, which is a powerful force, and had a support structure of scheduled tasks and appointment items that made my goal achievable. The goal setting software kept me focussed and on target when there were many other distractions that were pulling at my attention. I found that the actual setting of the goals could be improved... but hey, I guess we need to do some of the hard work. The software did not do much to help me to set SMART goals. So the responsibility for setting the right SMART goals is yours. Goal setting software helped me in developing my goal setting skill but the motivation and discipline needed to come from me! Ultimately the software provided a framework upon which to track my goals and the tasks that I set to achieve them – and kept me focused on achieving them. Goal Pro does the right things by helping you create a long-term goal and breaking the goal into short-term goals, and instilling success habits that are daily habits to achieve your vision. I highly recommend Achieve Planner. It was definitely well worth the experience for me. If you liked goal setting software then you may also like the free goal setting course.